Watch video report from VOA's Jesusemen Oni. World leaders and environmental groups have expressed their disappointment with U.S. President Donald Trump's decision to withdraw from the landmark Paris climate accord, the global effort to deal with the effects of climate change. French President Emmanuel Macron said in both French and English that he believed Trump has made a historic mistake. Macron said U.S. scientists and entrepreneurs would 'find in France a second homeland," inviting them to live in France where they could "work together on concrete solutions for our climate, our environment." Macron added in France they would work to "make our planet great again," a play on Trump's campaign slogan to "make America great again." German Chancellor Angela Merkel called the Paris Accord a "historic quantum leap." She went on to say "This decision cannot and will not stop those of us who feel obligated to protect our Earth. I say to all those for whom the future of our planet is important: let us continue on this path together so that we can succeed for Mother Earth." There was equal disappointment in the developing world. "My thoughts: The U.S. has just abdicated its leadership on a matter of critical global importance," Ghana President John Dramani Mahama tweeted. Trump said the United States was getting out of a deal he said imposed "draconian" burdens costing billions of dollars and millions of U.S. jobs. He described the pact as "very unfair" to the United States and beneficial to other major polluters, like China and India. He said he was open to "negotiations to re-enter the Paris Accord." But European leaders moved to put a stop to the U.S. leader's belief that he could re-negotiate the United States back into the accord. "We are firmly convinced that the agreement cannot be renegotiated," the leaders of Germany, France and Italy said in a joint statement. The Paris agreement commits signatories to efforts to reduce greenhouse gas emissions that cause global warming, which is blamed for melting ice caps and glaciers, rising sea levels and more violent weather. China is the world's biggest polluter. The United States is second and will join Nicaragua and Syria as the only countries that are not part of the agreement. Hua Chunying, a Chinese foreign ministry spokeswoman, said Friday that adherence to the Paris Accord is a "responsibility shouldered by China as a responsible major country." Friday in Beijing the spokeswoman said "We think the Paris accord reflects the widest agreement of the international community with regards to eliminate change and parties should cherish this hard-won outcome." Trump said it was in the interest of the U.S. to leave the accord, saying "I was elected to represent the citizens of Pittsburgh, not Paris." Bill Peduto, the mayor of Pittsburgh, where Hillary Clinton received 80 percent of the vote in the presidential election, said "Pittsburgh stands with the world and will follow Paris Agreement." Former U.S. President Barack Obama, who played a key role in brokering the accord, said "But even in the absence of American leadership; even as this administration joins a small handful of nations that reject the future; I'm confident that our states, cities and businesses will step up and do even more to lead the way, and help protect for future generations the one planet we've got." 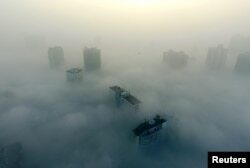 FILE - Buildings are seen on a hazy day in Xiangyang, Hubei province, China, Dec. 31, 2016. The current round of air pollution struck Friday and isn't expected to lift until Thursday. In Australia, Richard Di Natale, Australian Greens Party leader, said by pulling out of the Paris Accord, "Donald Trump has shown with this decision that the U.S. no longer has any claim to global leadership." Koichi Yamamoto, Japan's environment minister said of the U.S. departure from the Paris Accord: "It's as if they've turned their back on the wisdom of humanity." He added, "In addition to being disappointed, I'm also angry." Tuvalu Prime Minister Enele Sopoaga told Fiji Broadcasting Corporation his Pacific Island nation "provided our islands as a launching pad" for the U.S. during World War II, but "now we are facing the biggest war of our time, they are abandoning us." Voreqe Bainimarama, who will serve as president of U.N. climate talks in Germany later this year, said "While the loss of America's leadership is unfortunate, this is a struggle that is far from over." Canadian Prime Minister Justin Trudeau expressed his disappointment in a telephone call with Trump. The Canadian leader, however, said he is encouraged by "the growing momentum around the world to combat climate change and transition to clean growth economies." "The Paris Agreement provides the right global framework for protecting the prosperity and security of future generations, while keeping energy affordable and secure for our citizens and businesses," British Prime Minister Theresa May told Trump in a telephone conversation. Environmental group Climate Action Network said the U.S. withdrawal from the Paris agreement "signals that the Trump Administration is in total discord with both reality and the rest of the world."